British Prime Minister Theresa May will be forced to seek an extension to the Brexit deadline as the UK continues to grapple with yet more political turmoil. Speaker John Bercow - who determines parliamentary procedure in the House of Commons - yesterday ruled that Mrs May cannot bring her divorce deal back for a third vote unless it is fundamentally changed. The intervention blindsided Downing Street, which was last night scrambling to find a pathway out of the latest crisis that has been described by the UK's solicitor general as constitutional in nature. 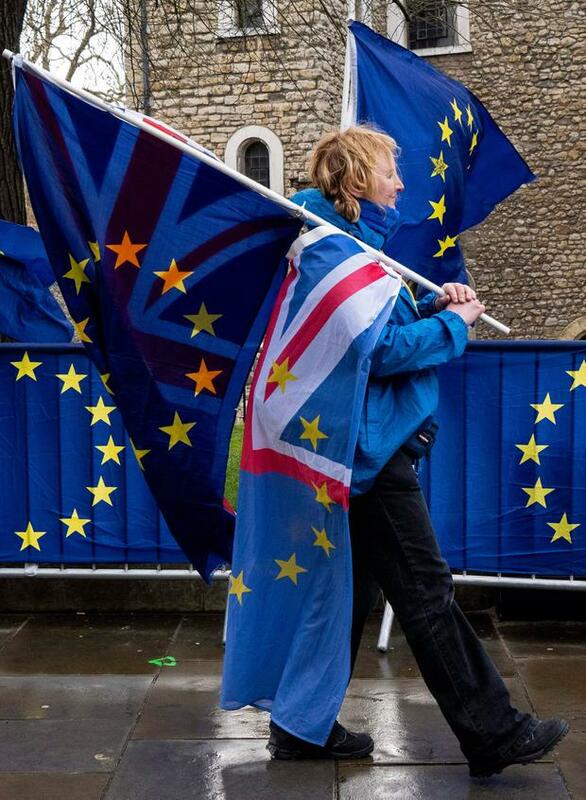 If the deal cannot be returned to parliament for a final meaningful vote it cannot be ratified by the UK, leaving a no-deal exit or an extension as the only options on the table. Diplomats in Brussels were said to be considering if an agreed extension to the Brexit date could be tagged on to the deal in order to allow it to be sent back to MPs for another vote. The UK government was also examining a number of routes around the speaker's ruling. Mr Bercow has set the bar high for his test on whether the deal could return, but said that his statement was not his final word on the issue. "This is my conclusion: if the government wishes to bring forward a new proposition that is neither the same, nor substantially the same as that disposed of by the house on March 12, this would be entirely in order," he said. He later appeared to suggest a change from the EU side - which has already been ruled out - would be necessary. "Fundamentally, for something to be different, it has to be by definition, fundamentally different. Not different in terms of wording, but difference in terms of substance and this is in the context of a negotiation with others outside the United Kingdom," he said. But there was no immediate clarity on whether the UK government could change domestic legislation to see the deal make its way to the floor again. Tánaiste Simon Coveney will meet Michel Barnier in Brussels today after hosting key EU players in the negotiations at an event in the city to mark St Patrick's Day last night. He said it was likely a significant extension would be sought by Mrs May, but said the latest twist in London had not done much to change this week's events. "We have to assume that because of the way in which the British parliament voted last week that the British prime minister will come to that summit and seek a significant extension of Article 50 and give a detailed explanation as to how she plans to use that time to try to provide some certainty, working with the EU, to the Brexit process," he said. He expressed surprised that a parliamentary procedure was being used to potentially prevent the vote. Meanwhile, efforts to shore up support for the deal in the event that there is another vote were also dealt a further blow last night as talks with the Democratic Unionist Party (DUP) failed again to break the impasse which has seen it twice reject the deal. It has emerged Tory negotiators are unlikely to reach an agreement this week that would allow the DUP to vote for the deal. The DUP's support is vital if Mrs May is to get her deal through parliament, as swaying it would pave the way for a significant chunk of Tory rebels to back it. British junior Brexit minister Kwasi Kwarteng said last night he believed there was still a chance parliament would approve the exit deal this week. He also warned that if the EU Council does not agree an extension then the UK will leave without a deal in just 10 days' time. Several options have emerged as potential ways out of the new parliamentary deadlock. Suspending this session of parliament - something that can only be done by Queen Elizabeth - in order to allow the deal to be voted on in a new session is seen as one way to circumvent the speaker's ruling which is based on precedent dating back to 1604. Mrs May will travel to Brussels on Thursday for a European Council summit, where it is now expected a delay of sorts will be agreed. Meanwhile, European Council President Donald Tusk is in Dublin today to discuss the latest developments with Taoiseach Leo Varadkar. An extension, which would see the UK remain a member for a portion of the new EU parliament which will sit from July, is seen as problematic by many EU capitals.